Baja California Sur is a very special place. All along the Sea of Cortez and the Pacific Ocean side of the peninsula, you’ll discover miles of pristine beaches and sparkling blue water. You’ll find hidden coves, unusual rock formations, bird sanctuaries, and desert wilderness. This entire area is considered a precious jewel of Mexico and of the planet, due to its immense diversity and its array of natural wealth, both on land and in the ocean. 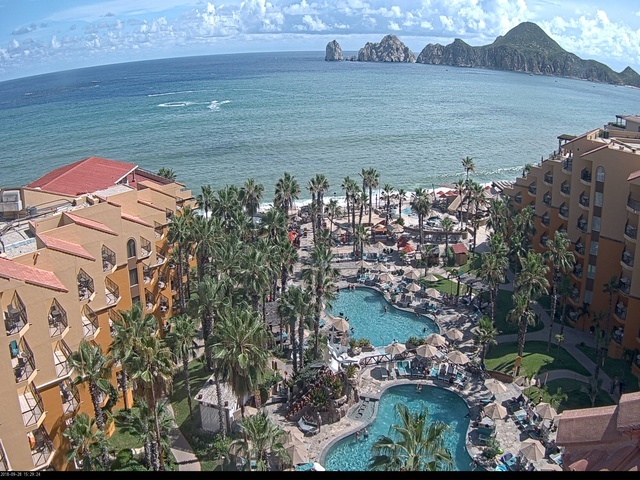 Every year thousands flock to Cabo San Lucas and Baja Peninsula to enjoy both its natural beauty and its great offering of sun, surf, activities and nightlife. Whether you prefer fishing, golfing, diving, kayaking, shopping or just lying on a gorgeous beach, you will find it all in Los Cabos! There are also many tours to enjoy. In the 20-mile oceanfront Tourist Corridor between Cabo San Lucas and San Jose del Cabo, Los Cabos has found new fame for its oceanfront championship golf courses. Cabo San Lucas, known for its lively atmosphere, big-money billfish tournaments and upscale services, sits on the turquoise bay of the same name. The town overlooks El Arco, the amazing natural-rock arch at the tip of the 900-mile-long Baja California Peninsula. Here, the Pacific Ocean and the Sea of Cortez meet at Land’s End. PLUS receive a Free Cabo Vacation Guide! © Cabo.com All Rights Reserved.